As part of their revitalization efforts, Burger King has launched a new line of chicken sandwiches. It’s kind of hard to come up with a new spin on chicken sandwiches, particularly with McDonald’s offering a Chick-Fil-A style southern chicken sandwich nationwide. Indeed, most of BK’s new chicken sandwiches follow the basic chicken club recipe. One, however, does not: the Chicken Parmesan. The Chicken Parmesan does things a little different. It’s a chicken breast (crispy or grilled, so obviously I went with crispy) topped with marinara sauce and melted Parmesan cheese. It’s simple, but it’s something new to fast food. There are so many variations on “cheddar bacon chicken ranch club” that doing another is unwise, and this is a nice alternative. The cheese and sauce are all perfectly fine, and the chicken breast patty is a nice size. It’s nowhere near the best sandwich I’ve had, but it’s a nice, vaguely Italian change of pace. 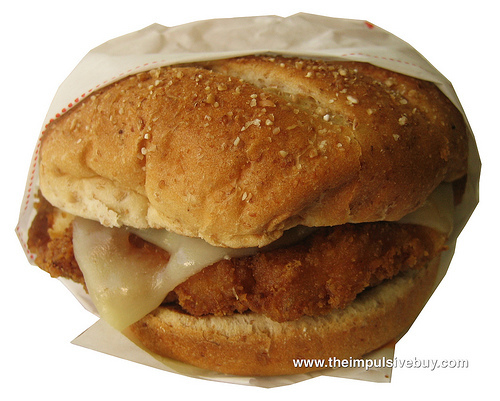 As a combo, Burger King’s Chicken Parmesan sandwich runs for around $6-7. It’s well worth the price. A couple of years ago, a sandwich like this might not have made waves, but in this fruit smoothie and snack wrap climate, an idea like this is nothing short of daring.